We bring forth an extensive range of Automotive Tapes, which includes PVC Adhesive Tapes, Double Sided Polyester Tapes, Foam Tapes and Masking Tapes. Available in various kinds pertaining to different industrial and commercial tasks, our range is both double and single sided and is used for pressure sensitive and for fitting the materials such as emblems, body side molding, mirrors and anti-drum mats. Moreover, these also find usage in air conditioners as they control noise and vibration. 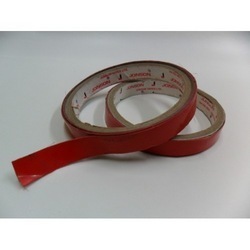 Our double sided polyester tape is manufactured with release liner to keep the adhesive secure. We offer double sided which can be supplied in custom made designs in various thickness and laminated to easily removable paper liner. These have back in of polyester film with initial tack and adhesion. 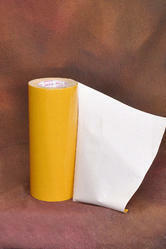 This is covered with rubber or solvent acrylic adhesive on both the sides. 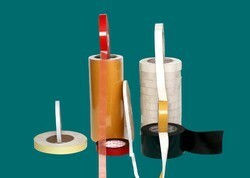 We manufacture and supply both single and double sided tapes which are required for various industrial use. These tapes give permanent fixing and are ideal for numerous applications including fixing numbers plate and signs on uneven surfaces. Our range of foam tapes find application in areas like automotive, industrial, construction, heating and air conditioning, weather stripping, recreational vehicle (RV), electronics and medical. Ideal for medical and electronics. We are engaged in supplying you the high in demand supreme quality masking tapes which are known for their wear and tear resistance. These don’t have a strong adhesive like many other just to ensure they can be taken off easily when required. These are highly used in painting business where a certain part is not supposed to be painted and later taken off. 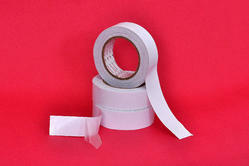 It is just the right strength of adhesive makes it a perfect tape for the work it is required for. Used indoors and out High temperature resistant Solvent resistant Eliminates screwing, riveting, welding, etc. Enhances reliable bonding High Performance Visco-elasticity of tape ensure better adhesion penetration into the surfaces and adheration to vibrations, thermal expansions Provides sealing, cushioning and impact resistivity.